A pupil of the great French classical painter Ingres, Degas appeared destined to become an academic artist but his interest in photography and admiration for Manet led him to experiment with modern subjects: most notably cafés, the ballet and horse-races. 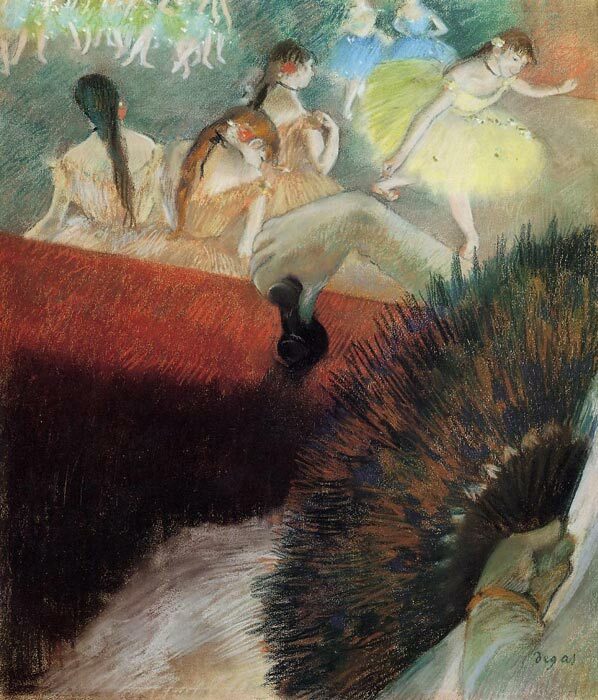 Degas ' innovative sense of composition emphasised movement and the idea of the casual glance. A key member of the Impressionists and a master of technique, Degas experimented with pastel, watercolour, printing and wax sculpture. SPECIAL NOTE : The painter will make the reproduction as close to the original oil painting as possible. If you want your painting to alter from this likeness, please email us and " At the Ballet, c.1880-1881 " will be reproduced according to your special requirements.